Is There A "Perfect" Direct Mail Piece? Is There A “Perfect” Direct Mail Piece? There is always an ongoing discussion about what type of direct mail piece works best for real estate investors. And what about the “perfect mail piece”? Is there such a thing? The truth is that we all have our favorites. But there is one thing I have learned over time and that is what works great in one area may not work the same in another area. To take that thought one step further, the perfect direct mail piece for one niche may bring terrible results in a different niche. I thought today I would take a look at some the different types of mail pieces that are available to choose from. I think it will take some testing to figure out exactly what will work best for you. What Are Some Of the Choices? The two main types of direct mail pieces are letters and postcards. These are what most real estate investors’ use for their direct mail campaigns. But if you are looking to step up your direct mail marketing a notch, zip letters and express letters are mail pieces that you can also add to the mix in your direct mail campaigns. So Exactly What Are Zip Letters and Express Letters? Zip letters are mail pieces that look like official documents. I probably get at least one or two zip letters as a marketing piece each month. Zip letters may look like there is a check on the inside. They also look a lot like something you would get like a state tax refund. Because they are “official” looking they tend to get opened by the recipient. 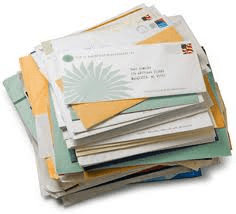 Express letters are mail pieces that are in a heavy cardboard envelope much like an overnight mailer. These too have a good open rate. How Much Does It Cost for Each of These Mail Pieces? The simple answer is the more you mail the cheaper it is per piece. If you can mail at least 1000 pieces at a time you can save some money. Most mailing companies will mail as few as a couple hundred pieces. I have some average prices for you for each type of mail piece. There is one thing to remember; the prices listed below include the cost of the materials, the postage and the labor involved. Because these companies are doing the mailing for you, this will allow you to focus on other activities in your business. Postcards in particular are very affordable to use for direct mail campaigns. You can get these done for you for about the cost of a postage stamp. It really doesn’t get any better than that. I have listed average prices for 1000 pieces of each type. If you mail larger quantities it will cost you less per piece. The opposite is also true; mailing fewer than 1000 pieces will cost a little more. Outsourcing; Is It Worth the Cost? I can tell you without a doubt that outsourcing all or part of your direct mail will allow you to do more deals and make more money. Just about everyone starts out doing all the printing, stuffing and hand addressing themselves. My advice to you is to outsource this job as soon as you can. It’s costing you money! You can’t produce and mail a postcard for the low cost a large mailing house will charge you. It’s almost impossible to stay on track with your direct mail campaigns doing everything yourself. The cost of outsourcing letters can be too high for most people at least in the beginning. As an alternative, print the letters yourself and hire someone to fold, stuff and address those letters. You will burn out trying to do everything yourself. Going back to our original question; “Is there a perfect direct mail piece”? I think some will work better than others for most real estate investors. But in the end, it's more about creating “perfect direct mail campaigns”. Next time we will continue the discussion on creating direct mail campaigns that work! ← How will my end buyer know that my house is a good deal? I agree that there is no one type of mail piece that is perfect for all niches. I really think hand addressed envelopes work best for probates. I have a college student that does my folding, stuffing and addressing for $10 a hundred. It’s worth every penny. I only do white letters for probates. I used “fancy postcards” from PostcardMania, and I love that company. However, I got the worst response on any mail piece I have ever used in 20 years. They don’t work for absentee owners and similar niches. Plain ugly yellow postcards have worked best for me without a doubt. I think mixing it up with mail pieces is a good idea, and I’m going to do a little more of that in the upcoming year. Thanks for your comments. Good information here Sharon. I get those zip letters all the time but I’ve never actually thought about using them myself. Your posts always give me something to think about! They are just one more tool Seth to help us stand out from the competition. I just found a source for them myself recently. I think that using some of the different pieces would work in the campaigns especially for folks that have responded to an earlier mail piece buy perhaps weren’t quite ready to sell. Yes, there is a perfect direct mail piece. The one they read and respond to. Problem is, that’s different for everyone. And so, we send multiple types. Thanks for your post, Sharon! That is the perfect answer! And you are right; that perfect piece is different in every market and for every niche. Sending multiple types of direct mail pieces on a rotation is something everyone should consider. Thanks for stopping by. That’s it in a nutshell. Your mail piece is just one piece of the puzzle. When all of the parts to the campaign are set up and executed every single month, that’s when the magic happens. Thanks for your input. Great article Sharon, letters vs post cards is definitely a heated debate in real estate marketing. However, no matter which way you slice it, the marketing piece itself is just a tool. It is up to you to consistently get your message out there, and that is what generates quality leads.